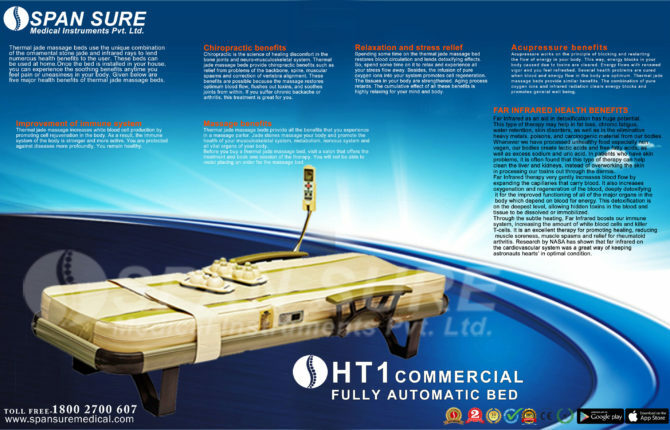 SPANSURE HT1 COMMERCIAL Spine Physiotherapy device Thermal massage bed is fully automatic thermal massage bed with all latest features like – Leg side extra Jade Rollers With BODY HEIGHT Setting option + CARBON FIBRE HEATING PANEL for extra FAR INFRARED RAYS for fast recovery . HT1 is designed for Commercial as well as Home use. It is easy to use with automatic and manual modes. It’s natural jade roller’s design is designed for perfect Acupressure & Chiropractic benefits to relax your body. that is why is is giving good Ideal Pressure according to ones body weight & gives optimum health benefits.The mechanism is the combination of western chiropractic care & eastern medicine knowledge. the repeated rolling of the warn Jade therapy rollers produces far infrared rays and give it at the acupuncture points at both sides of the spine. The 2 additional 3 balls & 9 balls jade projectors provides FAR INFRARED ENERGY & massage to the acupuncture points on the lower abdomen , especially the navel & the whole body. 1. This Therapy may Help the recovery of misaligned spine bones. 2. It may helps Activates the meridian acupuncture points , regulate the nervous system, it promote good blood circulation, activates the internal organs tissues. 3. It helps refresh mind & body. 4. As the jade stone rollers moves on the acupuncture & acupressure points it may helps to make good blood in the spine & function all organs better. 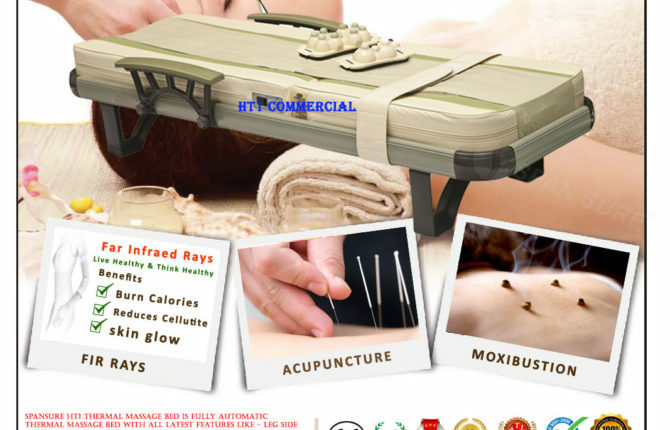 5.It is a mixture of 6 therapies principles mainly – ACUPUNCTURE , ACUPRESSURE, CHIROPRACTIC, MOXIBUSTION, MASSAGE & FAR INFRARED RAYS. Span Sure Medical Instruments pvt Ltd is the only company which is protecting consumer interest with the product return & Exchange policy. please see the below information for it. If you are not satisfied with the product delivered, you can request an exchange in a different type or other product. And again, at no extra cost to you ! For the 100 % protection of Customer SPAN SURE Medical is the only Company giving 15 days Money Back Guarantee to all the customers to win the trust of the customers for their 100% Full Satisfaction. If you are not satisfied with the product your product will be taken back & 100% money will be refunded without any question. For the safety of the customers company has started cash on delivery terms also. Now you will pay when the bed will be installed at your place. The Stones is designed to move smoothly along your spine based on the principles of Western chiropractic and combined with the Eastern principles of moxibustion and massage points.The balls massage up to your neck and gently massage your muscles along with the effect of moxibustion. This thermal jade massage bed has heated jade rollers and far infrared (FIR) heating elements apply the non-invasive, deep-penetrating, healing and rejuvenating far infrared healing energy to acupoints, meridians, tissues and spine. 1. May helps relieve the tension and pain caused by stressful works and improper posture. The jade floodlight is ergonomically designed to fit any part of your body to maximize the effect of Eastern moxibustion. Heat and far infrared rays are designed to be delivered to the target area with minimalloss. The unmatch designed guide rail minimizes friction between internal floodlight and rail and generates almost no noise. The rail only supports light load to improve durability.